The Police Department is located on the north end of the Rome Municipal Complex at the intersection of State Highway 13 and Alpine Drive. The mission of the Town of Rome Police Department is enhancement of the quality of life of residents and visitors through effective crime reduction, preservation of the peace, and responsiveness to social changes in the community. We strive to focus on proactive policing and crime prevention. Knowing law enforcement officers must maintain a high standard of conduct, the officers of the Town of Rome Police Department will strive to uphold the highest ethical ideals in both their professional and private lives. We will take an active role in establishing and maintaining a professional image of law enforcement in all our contacts with the public we serve through honesty and integrity. On behalf of the Town of Rome Police Department we would like to welcome you to the Rome Police Department’s website. The purpose of this website is to not only show you the vast array of services we provide, but also provide you with a resource for answering questions about our department and contacting us if the need should arise. 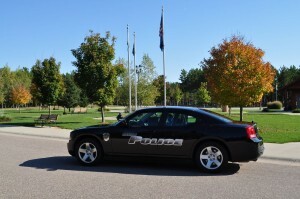 The Rome Police Department employs five full-time officers and several part-time officers, we provide police services 24-hour a day, seven days a week. We patrol approximately 56 square miles, which makes up the Rome Township in northern Adams County. We are a very progressive agency which strives to provide our community with exemplary police services through continued education/training of officers, and constant advancements in law enforcement technology. Please take some time to explore our website and learn about all the services we provide. We believe you will find that our officers are dedicated to not only enforcing the law, but also to the safety of each and every resident and visitor to the Town of Rome. Lock your keys in your vehicle? Each patrol vehicle is equipped with tools to assist you in opening your vehicle if you should accidentally lock your keys inside. If an officer is unable to unlock your vehicle we can provide you with local locksmith information. This is a free service to anyone in the Town of Rome. Officers of the Rome Police Department are licensed medical first responders and will respond to all medical emergencies in the Town of Rome as long as they are available. Every Rome Police Car is equipped with emergency medical equipment and Automated External Defibrillators (AED’s). If you need to be fingerprinted as a pre-employment requirement please call the Rome Police Department and an officer can assist you. There is a $10.00 fee for this service. Going on vacation? Or will your home be vacant for an extended period of time? The Rome Police Department would like to be notified if your residence will be vacant for an extended period of time. We provide you with a form to complete, which contains your contact information in case we would need to notify you with a concern/problem at your home.